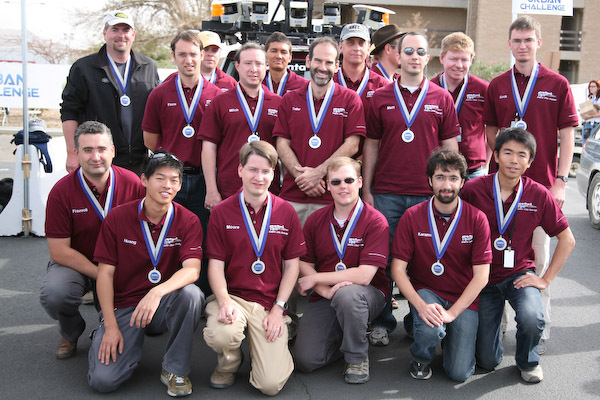 MIT, in partnership with Olin College and Draper Laboratory, competed in the 2007 DARPA Grand Challenge. We are thrilled that Talos, our Land Rover LR3, finished in fourth place and that it was one of six vehicles to complete the nearly 60-mile course! The challenge was the first of its kind to require vehicles to autonomously operate in a dynamic urban environment. Vehicles had to navigate a network of paved suburban and dirt roads among other autonomous cars as well as human-driven vehicles. The cars were tasked with completing a series of mock supply missions while obeying standard California driving laws. Much like people do, they had to deal with many of the challenges inherent to urban driving: navigating among other moving cars, re-planning due to roadblocks, etc. In this case, though, nobody was behind the wheel. Aug 25, 2008: Team MIT releases the full urban challenge race logs and log visualization software to the public: public data page. Mar 2, 2008: Two core software libraries developed by Team MIT live on as google code projects: LCM library for Lightweight Communications and Marshalling and Camunits library for real-time image acquisition and processing. Nov 3, 2007: Talos is one of six teams to cross the finish line in the Urban Challenge Final Event, finishing in 4th place overall! Nov 1, 2007: Team MIT is one of the eleven teams qualified by DARPA to participate in the Urban Challenge Final Event on November 3rd! Oct 8, 2007: Team MIT's vehicle arrives safely in California. Oct 2, 2007: Team MIT's Talos II left for California today. The vehicle is on an 7 day journey to El Toro, California. Oct 1, 2007: CSAIL holds a send-off barbecue party for Team MIT shortly before the vehicle ships out. Several pictures are available, courtesy of Jason Dorfman. Sep. 29, 2007: MIT's DGC vehicle is on display from 9:30am-noon as part of the Mark Epstein Innovation Gallery Grand Opening Celebration! (link). Sep. 28, 2007: MIT's newspaper, The Tech, features an article on the team. Sep. 19, 2007: Team MIT is featured on Boston's WCVB channel 5. The story and video are available on their website. Aug. 10, 2007: Team MIT is selected as a semifinalist in the Urban Challenge (press release). May 11, 2007: Team MIT advances to the next stage in the Urban Challenge (press release). Oct. 2, 2006: Team MIT is one of the eleven teams selected for track A funding by DARPA! The official press release is available from DARPA's website. Sep. 1, 2006: There is a DGC-related course for undergrad (6.142) and grad (6.897) students. Aug. 24, 2006: The car is back and we have started interfacing with the drive-by-wire system.